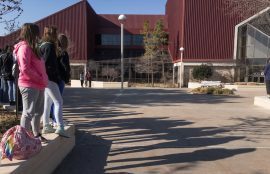 Pathway High School students at Oklahoma City Community College decided to walkout to remember students who lost their lives due to gun violence. Oklahoma City Community College Division Assistant, Rochelle Mosby said she was proud of the students who chose to walk out Wednesday. Mosby said the students quietly walked out of OCCC at 10 a.m. and stood in front of the Main Building for 17 minutes. The students were met with glances from college students. Madelyn Primeaux, a freshman at Pathways, said she organized the walk out to honor the students of the Parkland shooting. She said the students stood silently for 17 minutes. “I saw walkouts were happening everywhere and it meant a lot to me, because it could have been any one of us in that classroom,” she said. The Parkland shooter, 19-year-old Nikolas Cruz, charged into Marjory Stoneman Douglas High School in Florida and killed students and teachers with an AR-15 semi-automatic rifle. The attack sent shockwaves through the United States, prompting walkouts against gun violence. Unlike the several other high school walkouts happening across America, the students at Pathways concurrent high school decided they would not touch on the topic of gun control, but rather focus on the lives lost. Primeaux said she wanted legislators to make a change to help keep students like her safe. “We wanted to show the legislature that we are the new generation coming up and we have a voice,” she said.